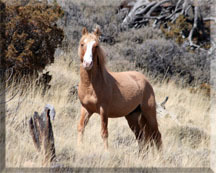 We invite you to become a foster parent of a Pryor Mountain Wild Horse! The Pryor Mountain Wild Mustang Center is pleased to announce that since the beginning of the Foster Horse Program in August 2010 we have 50 Foster Horse “parents”. We are pleased to add three more horses to the Foster Horse Program. 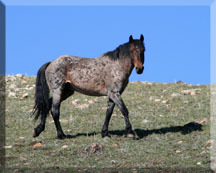 The Center is committed to preserving the Pryor Mountain Wild Horses. 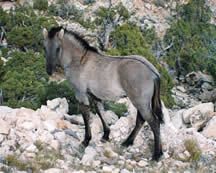 In order to achieve this goal, the lands of the Pryor Mountain Wild Horse Range must be preserved as well. We invite you to participate in these goals by joining this Foster Program. 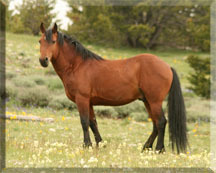 For a donation of $30.00, supporters will receive a foster packet for the available horse of their choice. The donations will be directly applied to range improvement projects that will help ensure the health of the wild horses. From each $30.00 donation, $20.00 will be allocated for range improvement projects. Examples of range improvement projects include reseeding, developing new water sources, and improving educational signage. 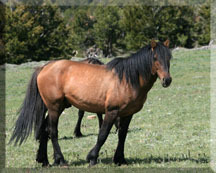 Thanks to all of our Foster Horse “parents” we are now in the planning stages with the Big Horn Canyon National Park Service to design and construct a large Educational sign that will pay tribute to Admiral & Kapitan as well as information about the significance of the Pryor Mountain Wild Horses. It will also bring awareness to the fact that driving carefully and slowly is the safest & best way to drive through the Wild Horse Range for people as well as the horses. The planned site for this sign will most likely be located at the Crooked Creek Bay Pullover area. Part of the funds will come directly from the Foster Horse Program donations! 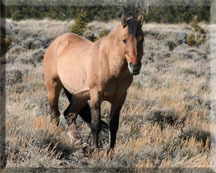 The Pryor Mountain Wild Horse Range Foster Horse Program packet contains a beautiful 8″ X 10″ colored photograph of the horse as well as a certificate suitable for framing and pertinent information on the horse. Members of the Foster Horse Program will also receive news on the achievements made possible by their support.